California Corner and Energy Savings: Advanced Framing Techniques- Armchair Builder :: Blog :: Build, renovate, & repair your own home. Save money as an owner builder. Do you know what a California corner is? It has nothing to do with Beverly Hills and everything to do with energy efficiency in your new building project. This is one of many advanced framing techniques that help us build better quality, energy efficient homes. We just completed a detailed video about California corners and advanced framing techniques. In this video, we discuss the problems associated with outdated house framing methods. Placing just one wall stud with the wrong orientation can lead to serious energy loss, higher utility bills, and the potential for condensation and even frost on interior wall surfaces. Have you ever heard of a cold corner? In this video we discuss what causes cold corners in homes. We show you how a California Corner can alleviate this problem. Although it’s not new, it still has yet to gain widespread implementation in site built construction. I walked into a new house under construction yesterday that had the inefficient method of framing a corner. 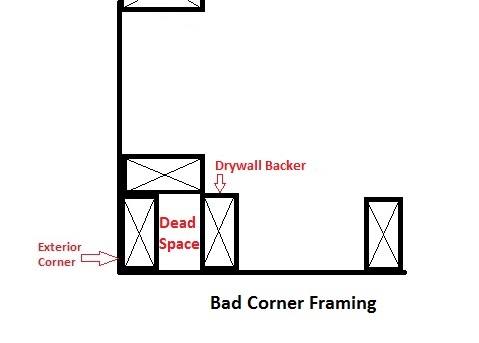 Let’s dig a little deeper into the right and wrong way to frame an exterior corner in a home. The picture below shows the inefficient way to frame an exterior corner. This picture shows the plan view of a framed wall corner (looking down on it). The top and doubler plates (the horizontal 2×4’s at the top of the wall) have been removed so you can see the studs. The drywall backer is the stud added to support the drywall sheet at the corner to prevent cracking. The way this stud has been installed prevents the insulation contractor from insulating the corner. This is the area labelled “Dead Space”. Because this area is closed off, there is no way to get insulation in there. The insulation contractor will come through the inside of the home and insulate each stud bay…and will miss the “Dead Space”. 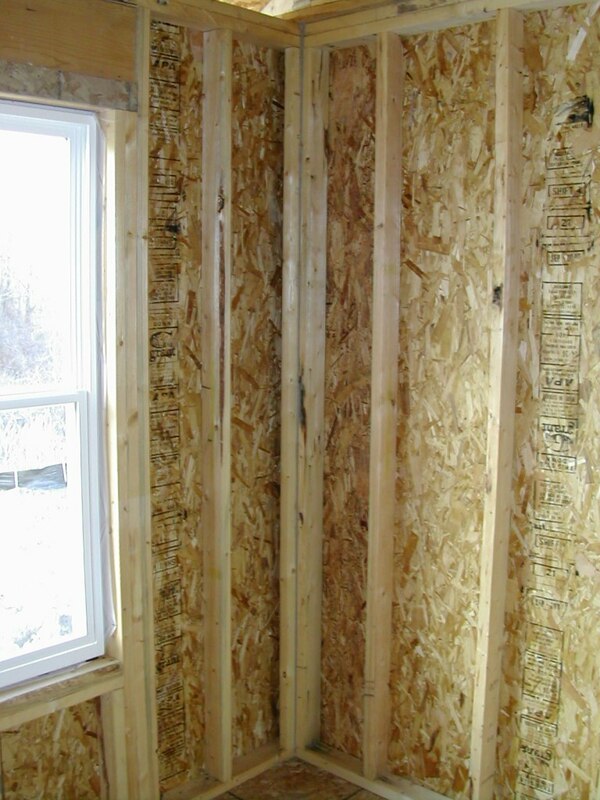 Don’t forget, there is plywood or OSB sheathing on the outside of the wall, so there is no access from the outside either. Without insulation, the corner will negatively affect the energy efficiency of the building. In cold climates with this framing setup, I have seen condensation at the corners of homes. On one occasion in extremely cold temperatures, I have witnessed a home with frost on the drywall at the corner. And if there is condensation on the surface of the wall, there is a chance there is moisture in the wall which could lead to mold. 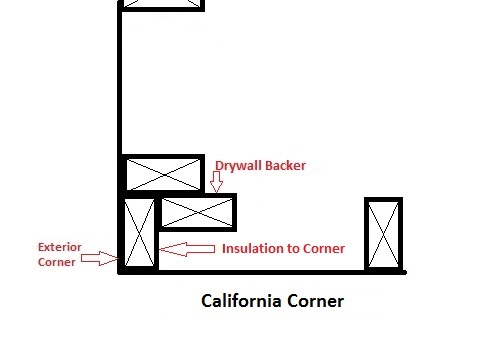 So, let’s take a look at the California corner below which is a better way to frame an exterior corner. By just turning the drywall backer stud to create the California Corner, we are able to eliminate the “dead space”. This allows the insulation contractor access to the corner to insulate properly. What Does the California Corner Cost? That’s the great part…there is no additional out of pocket cost…which is a no brainer in my book. You will need to spend a little time educating your framing contractor about the California Corner (if they don’t know about this technique already). And you will want to look for it when you do your frame quality check. Check out our new video on the California Corner and Advanced Framing Techniques for a more detailed explanation. Have you ever thought about building your own home? Be sure to stop by the Armchair Builder How to Build Your Own Home resource page. If you need a detailed frame quality checklist, check out our ESTORE. We have included our frame quality checklist created from years of home building experience in The Builder’s Daily Construction Guide that you might be interested in.